Religion is one of the most pandered issues in American politics. Candidates for the Republican nomination compete for the title of most religiously pious. President Obama professes to be a Christian. Of course, if he didn't he wouldn't be president. Though several presidents, none in recent history, have had no particular religious affiliation, they all claimed to be Christians. In an interactive map entitled, "Topography of Faith," USA Today presents the results of an extensive Pew poll involving over 36,000 American adults. For the country as a whole and for individual states, percentages are given for each religion including Christian, Muslim, Jewish, and several others. 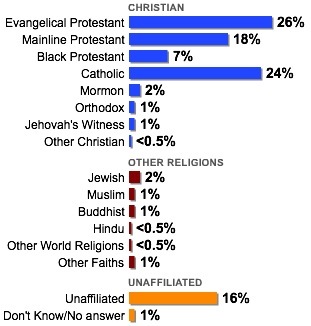 Also included in the Pew poll are "unaffiliated" which includes atheist, agnostic, and "nothing in particular." For the nation as a whole 16% of those polled, that's about one in six and the 4th largest group just behind mainline Protestant, stated they were unaffiliated. Of the 535 members of Congress exactly one is openly atheist. Panderbear concludes from these numbers that atheists and other non-affiliated people are underrepresented in the U.S. Congress by almost two orders of magnitude. This may make atheists the most underrepresented segment of the population in America. In a country that professes freedom of religion as a fundamental right, this seems more than a little hypocritical. Revealing and encouraging statistics. Great read - thanks. Don't trust anyone who isn't an atheist. Where did you get the idea that there are 538 members of congress? There are 438 members of the House of Representatives plus 100 Senators. That's why Nate Silver's N.Y. Times blog is call FiveThirtyEight. What a surprising question. Where are we? Actually there are 435 members of the House (441 if you count the non-voting members). Nate's blog refers to the 538 members of the electoral college which includes 3 electors from DC. Thanks for the correction and clarification Jim. Yet I wish that the Unaffiliated bar was broken down further by group, ie, believers who may not like organized religion vs. fully evolved nonbelievers. There's a whole lot of gray area there that I would be curious about statistically. Thanks for the comment. Sounds like fodder for another post. Indeed. Who doesn't love a graph. And I doubt that this one member of congress was elected with his electorate aware that he was an atheist. How would that happen? Unaffiliated becomes a brave word in politics. Though, in reality, it is the equivalent of covering your mouth and mumbling. Ahh, the world. Pete Stark came out of the religious closet decades ago. Note that Panderbear resided in the adjacent Contra Costa County for about a millennium before moving to Arkansas. California and Arkansas are really, really different.